"Stable prices, hardly any panic on the avocado market"
Last summer, avocado prices dropped to a low point. "Everyone thinks avocados are green gold, which they are, in my opinion. However, you do have to understand the product", says Ine Potting of the Dutch wholesaler, Scherpenhuizen. "Last summer, too many people thought they would get a share of the market on the production side. Along with a few importers without clients, this resulted in those low prices." According to this importer, there does not have to be a repeat of that situation this year. "The market can offer a better supply is the volumes are spread out more. They also must not all arrive at the same time. In general, I still see an ever-increasing demand on the avocado market. This demand is greater than the supply." The current demand on the avocado market is good. "I see pressure on the market only in France. Sales to the remaining European countries are going well. Prices are stable and are at a good level for this time of year." "The supply is usually always somewhat lower in February and March. This is when supplies from places such as Spain, Israel, Chile, and Colombia start drying up. 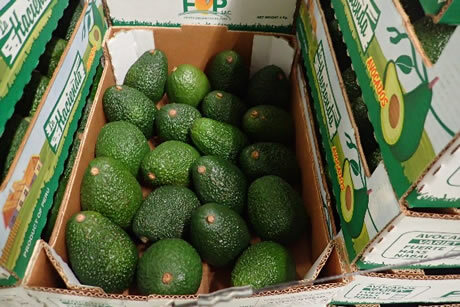 Meanwhile, the first avocados from Peru have already arrived", Ine continues. The current price for the 4kg large sizes (12-14) is at about the EUR11 level. The 16-18 sizes are selling for around EUR10,50 to EUR11. The sales price for 20's is roughly EUR10,50, with 22 to 24's going for EUR9,50 to EUR10. The 10kg smaller sizes are being sold for EUR18. "The product is of excellent quality. There will probably be very little trade done during the trade show. This might result in small stocks here and there. However, if you have good programs, trading will continue well", concludes Ine.